Yorktown's Ryan Van Kirk handles the ball in the open court. The Patriots' primary ball-handler, he also poured in 30 points. 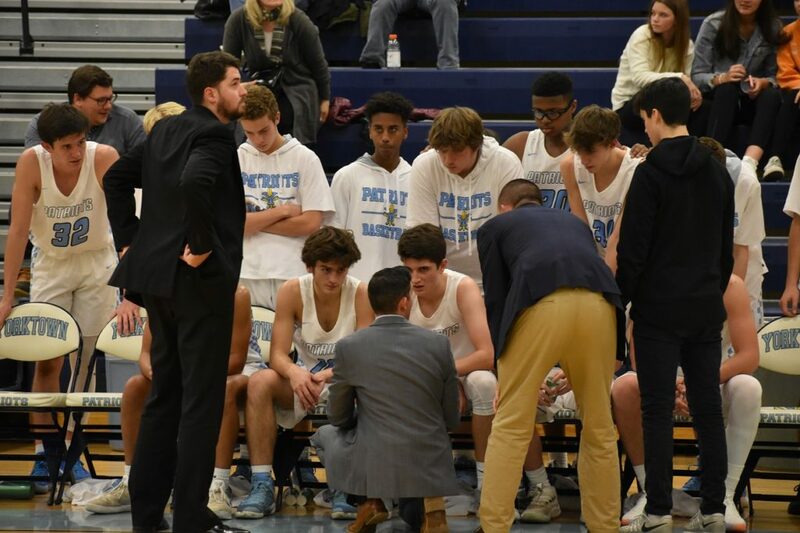 When we talked to Yorktown boys coach Joe Reed before the season, he told us he’d take guard Ryan Van Kirk just as soon as he’d take any guard around. Now we understand why. Wednesday night Van Kirk scored 30 points to lead his team to a 61-45 home win over previously undefeated Edison. The Patriot point guard was ridiculously efficient, doing his damage on 14-20 shooting from the field and threading his way through the Edison defense to get to the rim almost at will. Even Van Kirk was a little surprised by his team’s resounding win, given that the Patriots had just played a game the previous night. On Tuesday the Patriots fell on the road to Hayfield by ten points, a team Edison defeated earlier in the year. That they did. The host Patriots went up 14-7 after one quarter and even with Van Kirk’s exceptional performance this was definitely a team win. On offense Reed’s team registered assists on over half its buckets. On defense his team frustrated Edison with a solid matchup zone all night, holding talented Eagle guards Nate Hester and Jared Clawson to just three points combined in the first half. Yorktown coach Joe Reed addresses the Patriots in the second half. Those two rebounded to do some damage in the second half. It wasn’t enough, however, as the Eagles just seemed to never get in much of a rhythm all night. Edison as a team could manage only the same amount of made baskets as Van Kirk (14) and that was on 51 attempts. Several times Edison upped the defensive intensity in an effort to tire out Yorktown but the Patriots were able to calmly counter each time. Edison was well-rested, having not played in five days, but the Eagles were not able to take advantage of that fact. Edison (2-1) was led by Clawson and reserve guard Donavon Staples, who each contributed 11 points. The Eagles will look to rebound Friday night at North Stafford. Van Kirk and Yorktown (2-2) got good support from seniors Zach McCoskrie, Neil Carroll, and John Dolan, who contributed eight points a piece. The Patriots will be in action again next Tuesday, at Lake Braddock. It was a memorable night for Yorktown. 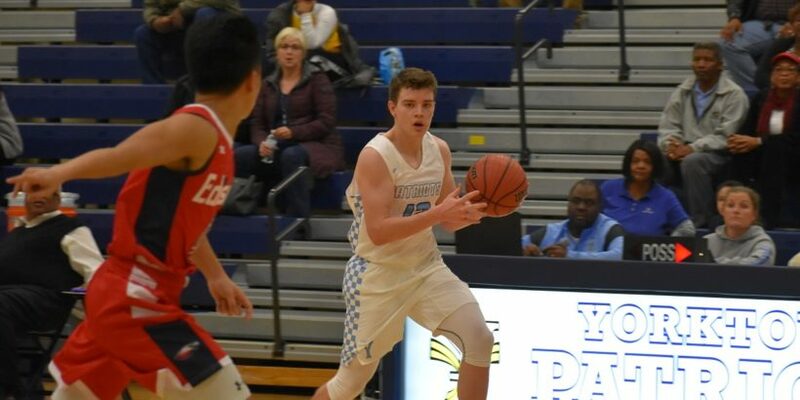 The Patriots have faced adversity, losing sophomore guard Liam Andersen for the year due to injury, but they showed they still have the firepower to compete.